Britain's first national trail, the Pennine Way, celebrates its 50th anniversary on 24th April. Presenter Paul Rose took a journey along the "Backbone of England" and considered the post-war social revolution which helped open it up to the public. He says "There's something deep within our DNA that makes us want to explore. I've been lucky enough to spend years running expeditions in Antarctica as well as diving some of the world's great oceans, but nothing prepared me for the challenge that's not far from my own front door." The Pennine Way measures 268 miles, from the Peak District to the Scottish Borders, and takes in three national parks and one area of outstanding natural beauty. So adding a bit of transport to the story. 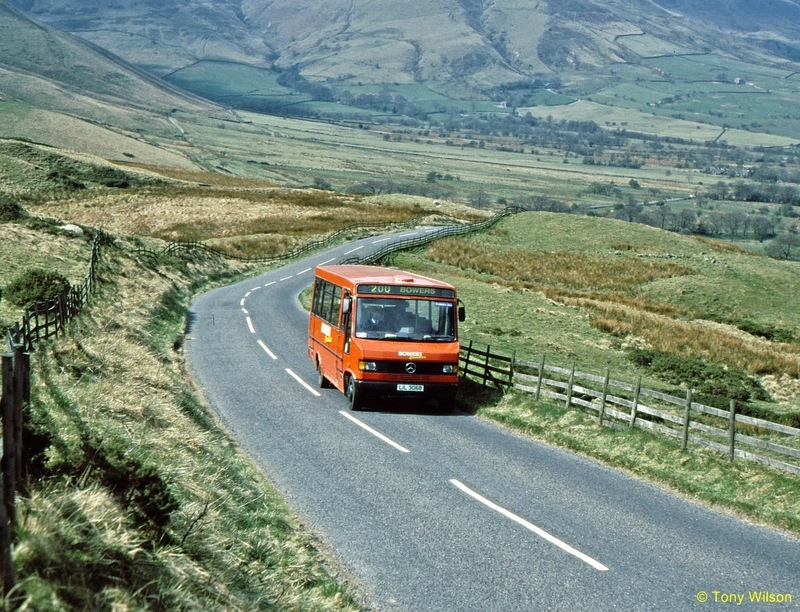 Above we see a Reeve Burgess bodied Mercedes-Benz 709D operated by Bowers of Chapel-en-le-Frith climbs away from Edale back in April 2002. The start of the Way is just out of shot to the right of the image. 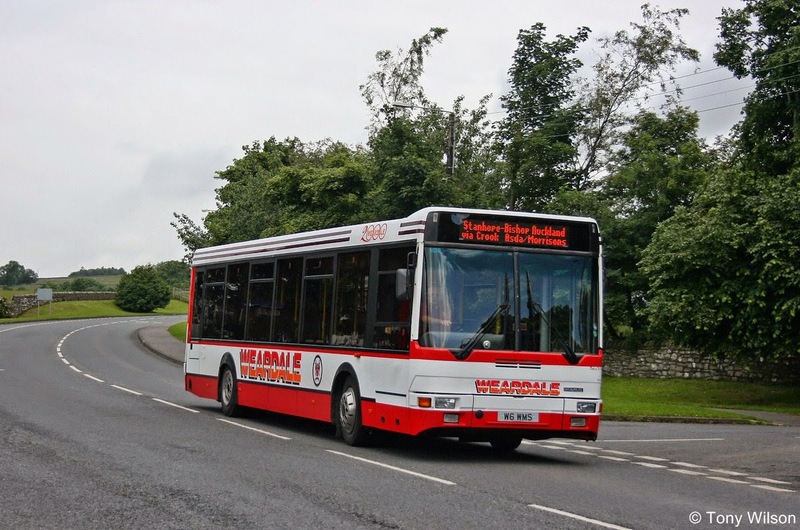 It is believed that the bus was originally registered E305 BWL as fleet number 305 with the South Midland company. 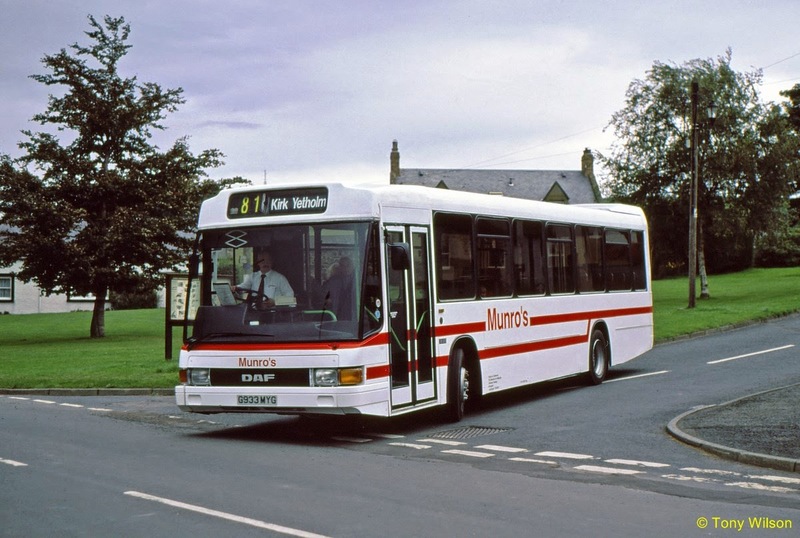 At the other end, below is a former East London Optare Delta fleet number DA5, and shown here making a reverse turn at the Kirk Yetholm village terminal point in August 2001, wherein lays the top end of the Way. It's 50 years old, but its roots go back much further than that. In 1935 a letter from the United States landed on the desk of Daily Herald journalist Tom Stephenson. He was the countryside correspondent for the paper and was being asked if there was a long-distance route - similar to the 2,500-mile-long Appalachian Trail - that could be tackled by two American women on a walking holiday in England. Tom knew only too well that the answer was a big no. Much of the uplands remained in private hands, but the mood was changing. The mass trespass at Kinder Scout in 1932 had shown that some walkers weren't prepared to back down from confronting landlords and gamekeepers. Hiking was becoming more popular. With more leisure time on their hands, workers wanted to stretch their legs in the countryside. Tom - who would later become secretary of the Ramblers' Association - spotted an opportunity. With social attitudes changing after World War Two he prodded, cajoled and convinced the authorities that a "long green trail" could be established across the North's rugged uplands. But even as the last footpaths and rights of way were being joined together, some landowners remained deeply sceptical of the whole idea. Walkers couldn't be trusted to cross wild areas of land without causing damage and leaving litter. On 24th April 1965 - 30 years after Tom Stephenson had the idea - the Pennine Way became a reality. At an opening ceremony in the Yorkshire Dales village of Malham, hundreds of hikers gathered. Tom wanted the Pennine Way to be a significant test: an escape from the buzz of modern life. Fifty years on it certainly still achieves that and will take a fit, committed walker two to three weeks to complete. Most hikers tend to do the route south to north; starting in Edale in the Peak District and ending at Kirk Yetholm in the Scottish Borders. It takes in the Yorkshire Dales, Teesdale, the North Pennines and the Cheviot Hills in Northumberland. With this in mind a trio of transport from along the Way. 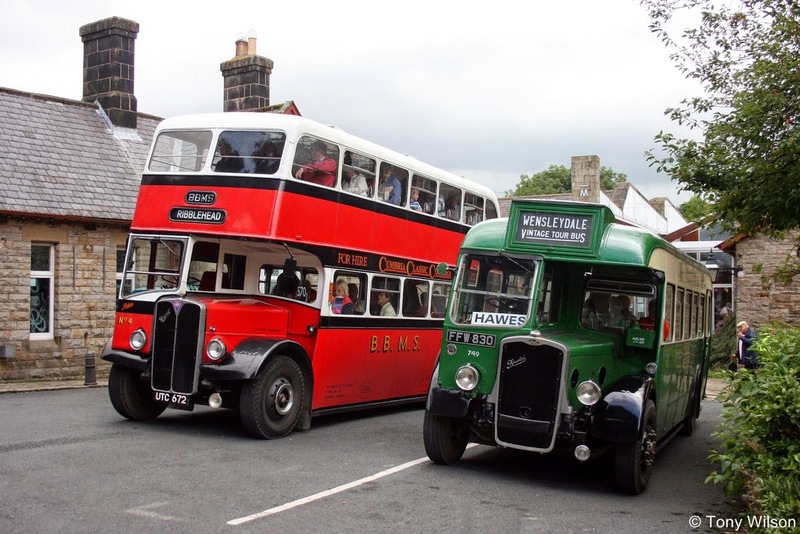 The Yorkshire Dales town of Hawes provides some seasonal interest in the shape of two vintage bus operators. 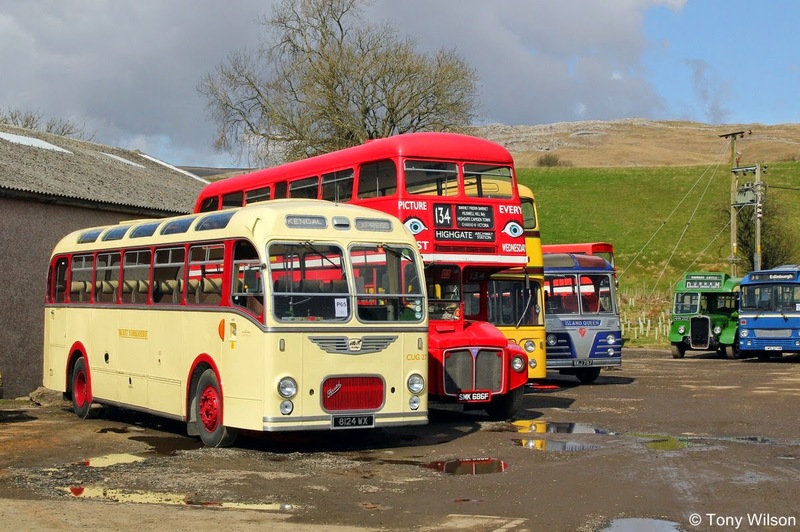 Here on the left a former Bamber Bridge Motor Services East Lancs bodied AEC Regent; on the right a former Lincolnshire Road Car Company ECW bodied Bristol L. Respectively they are now owned and operated on 'heritage' services by Cumbria Classic Coaches and Vintage Omnibus Services. Coordinated the routes are timed to meet at the old station yard. With the Way passing through Horton-in-Ribblesdale further up the Settle & Carlisle railway line, a class 37 diesel heads north through Ribblehead Station and then onwards over the famous Ribblehead Viaduct. 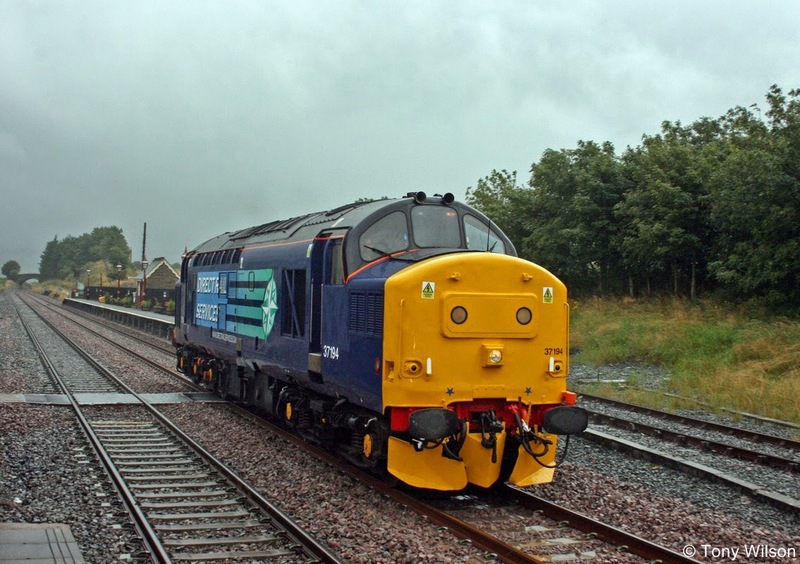 What other company would operate through Weardale than one with that very name. Here a DAF with Ikarus bodywork and suitable registration plate completes the terminal point turn at the western end of Stanhope. But the beauty of the Pennine Way is you don't have to do it all in one go. Some people do it in stages, taking a lifetime to complete the whole route. The Pennine Way comes with a fearsome reputation; after all, it's a journey along the backbone of Britain. The weather is legendary too. The Pennines get more than their fair share of rain, but the paths are now much better, and the signage has improved.